Tick Talk » Looking for a Deal? Russian Watch Lover left a comment about my review of a Vostok watch I serviced. He asks what I would recommend for a mechanical watch under $100. Don’t get attached to it. When you buy a mechanical watch for under $100 you should expect it to be only moderately accurate (within 10 or 15 seconds a day). It will most likely have an eastern European or Chinese movement in it so spare parts are probably not readily available here in the U.S. I would say expect to throw it away in five years instead of having it serviced. If you like the way it looks it can be lots of fun and for the price its probably worth it. Timex tried a $99 automatic about 4 years ago at Christmas time but it didn’t fare so well. I saw an Armitron automatic at Wal-Mart the other day. Fossil has mechanical and pseudo-mechanical watches for very reasonable prices. All of these are disposable – not meant to be serviced. My experience with Russian watches is limited but I wasn’t pleased with the Vostok I serviced. One way to get a quality watch for under $100 is to buy a vintage mechanical. Don’t expect to find a steal on e-Bay. It’s pretty well picked over these days, but you may find a treasure at a yard sale or a flea market. I have a couple really nice watches I bought at garage sales. Unfortunately you will most likely have to get these watches serviced. Expect to pay $100 to $250 for a mechanical or simple automatic for service, but you could end up with a really nice watch. When buying vintage remember that movement parts are attainable but dials, hands and cases are harder to come by so buy a watch that looks like it’s in really good condition and let your watchmaker worry about the movement. 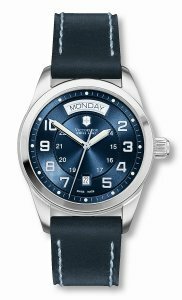 As for good deals on current production mechanical watches I recommend Victorinox Swiss Army and Hamilton. Both of these brands use well made Swiss Movements and house them in well built cases. Automatic Swiss Army watches start with a MSRP of about $600. Some other brands to look at are Accutron, Seiko & Citizen. This entry was written by Jordan Ficklin and posted on February 19, 2009 at 8:59 am and filed under watches. Bookmark the permalink. Follow any comments here with the RSS feed for this post. Post a comment or leave a trackback: Trackback URL. Mid-quality vintage is the obvious answer, but when you do so of course you essentially need to factor in the cost of a service too, plus any attendant difficulties of parts availability and/or problems and shortcomings owing to neglect. One line that constantly gets overlooked in this range is the Seiko 5 series, some of which are available in automatics for as little as $50-$60 if you find one on sale. Chronometer-grade they ain’t, but fairly reliable and respectable at least. Would mostly agree though that most of the Chinese (including the Timex) and Russian offerings in the same range aren’t worth bothering with. +1 on the Seiko 5. It’s so affordable, I had no qualms about opening the back and tweaking the regulator on mine. I second the yard sale/garage sale recommendation. Last summer, I picked up a plastic bag with five or six watches non-running watches for $3.50. Most of them were junk, but there was also a WWII era Hamilton and a triple-date, automatic Movado. Another vote for Seiko 5. Seems like there are hard to find in stores in the US but plenty on eBay. I’ve had good fortune with the Seiko movements in my beater watches… My watchmaker has timed these to +- 10 seconds per day and some are even closer to COSC. I had a Seiko 5 I bought used in a pawnshop in ’73. I wore it for thirty years, never serviced it, it never failed to run, and I sold it for the same $25 I paid for it. It always kept quite good time, too. Wenger Swiss Military watches are a pretty good step below Victorinox. Their cases and bracelets and made of cheaper materials. I haven’t seen any of their mechanical models but their quartz models have a cheap feel to them. Does anyone have feedback on Invicta models with the Swiss Sellita or Japanese Miyota movements? These seem to be affordable, but I don’t know how they last. I bought my teenage son a really nice Invicta auto for his birthday. He loves it and he gets a lot of comments on it. It has some positional error and although I bought it new, I think the escapement, might be a little dirty from what I see on my timing machine, but overall for the money, it is OK. It has the Miyota movment in it. Be aware that I get a lot of these almost new Invictas in for service with the Jaapanese and Swiss movements. I just got one in today that was stopped. Basically brand new, with a dry and dirty movment. A regular service put them right, and they should hold up fine. BTW, I have seen brand new $1000 Swiss watches that have errors over 10 seconds. Unless it is a chronometer, that is not uncommon. If you are a serious watch person, you are better off with the affordability and quality of vintage. If you like the looks then Invictas are fine. For those who do not know: Hamilton cases are made in China (ETA factory in Shenzhen). They’re good-looking, though. I’ve a number of Vostok and Molnija automatics in the under $100USD range all purchased new. They are not partucularly acurate, +- a minute a day even, but they’ve not failed me after years of use. I don’t care much about acuracy myself… my mobile can cover that. I vote for Seiko 5 as well. A lot of choices for under $50 on ebay from Singapore. They’re nice looking, tough, and reasonably accurate. I’ve had mine for 4 years now and it runs great (15 seconds fast a month if I leave it crown down at night and keep the power reserve fairly full). Well it looks like most of us feel the low-end Japanese models are better than the Russian models – and they are decent watches. For under $100 that’s a deal if you don’t want to pass it along to the next generation.